The size of breasts varies among individuals and even during the course of life for a host of reasons. Unlike other appendages, the breast probably undergoes the greatest degree of changes in size and shape over years and decades. It happens in both males and females. However, it is more obvious in women who naturally have significantly larger breasts than males. For most women, the concern is when the breast size changes significantly within a short period of time – like weeks and months. While there may be physiological reasons for this change that is nothing to worry about, there are also instances where these changes are due to pathological reason (diseases and disorders). These are just some of the main factors. It is important to remember that certain medication, prior breast surgery, ongoing breast support (with a brassiere) and other factors can also influence breast size over a short period or lifelong. Sagging of the breasts is another factor that determines shape, rather than size. It is largely a consequence of size and stretching of Cooper’s ligaments that maintain the structural integrity of the breasts. Breast size in females increases from late childhood to adulthood, peaks and then decreases later in a woman’s life. This is considered normal although the degree of breast enlargement and shrinking vary among individuals. Breast size is directly linked to certain hormone levels both in the short and long term, be it during puberty, with changes in the menstrual cycle, pregnancy, breastfeeding or menopause. The breasts are primarily composed of fatty tissue which plays a large role in determining breast size. A higher body fat content will therefore increase breast size. Pregnancy, childbirth and breastfeeding thereafter all affect pregnancy both in the short and long term. It also contributes greatly to sagging of the breasts even after breastfeeding ceases. It is now known that there are several genes which appear to determine breast size. While it may be one of the most significant determinants, it is not the only factor as discussed above. When Is Enlargement Or Shrinking Breasts A Problem? Here are some of the medical causes of breast enlargement (hypermastia). Physiologic changes like pregnancy need to be first excluded before pathological causes should be considered. Any trauma to the breast can lead to enlargement as result of swelling. The nature of this trauma can vary from a blow to the chest and breasts either accidentally or purposely, to chest wall and breast surgery. Constant pressure on the breast with poorly fitting and tight bras can also cause injury. Both benign (non-cancerous) and malignant (cancerous) tumors may be responsible for enlargement of the breasts. It may not always be the entire breast that is enlarged but rather the swelling or mass is isolated to the affected part of the breast. Fibrocystic breast disease may also lead to the formation of multiple lumps in the breast. Mastitis is a common condition particularly among breastfeeding women. As a result of the infection, swelling may occur as part of the inflammatory process. Infections of breast tissue without breastfeeding (non-lactation) are uncommon but may be seen after penetrating injuries or following surgery to the breasts. An abscess may also cause enlargement with one or more painful lumps. Diseases which leads to abnormal levels of circulating hormones, like estrogen and progesterone, can also cause breast enlargement. 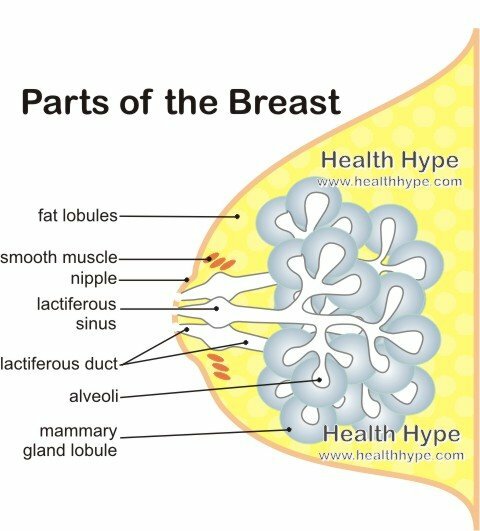 The breast tissue is stimulated to hypertrophy as a result of the hormones. Polycystic ovarian syndrome (PCOS) and galactorrhea are two such possible conditions. Pituitary gland diseases may also contribute as there may be disruption of normal ovarian hormone regulation. A reduction in the size of breasts (hypomastia) is more often seen in women of 40 years and older. It is largely driven by hormonal changes. Moderate shrinking is not considered abnormal in menopausal women. Discontinuing hormone contraceptives can lead to a reduction in breast size. This is a result of the decline in the previously elevated estrogen and/or progesterone levels. It is a transient consequence which ceases once the menstrual cycle stabilizes. Stopping hormone replacement therapy (HRT) may also have a similar effect. A rupture in breast implants can lead to deflation and reduction in breast size. It is not common and when it occurs it is usually one-sided. Deflation is more likely to occur with saline-filled implants than with silicon implants. The reason is that saline absorbs into the body while the gel silicon may maintain the size for long periods since it is not readily absorbed. Anorexia nervosa may lead to breast size reduction. It is however not the breasts alone that shrink but there is extensive fat loss and shrinking throughout the body. Eating disorders in general can contribute to hormonal problems which may in turn lead to shrinking in breast size. Cachexia is also known as wasting syndrome. It may be accompanied by disturbances in appetite which further hastens the wasting. Cachexia is seen in severe medical conditions like with cancer, HIV/AIDS, certain types of heart disease and with other infections like tuberculosis.